Alba- Alba is a skipper/owner 55-foot yacht operated by Markos out of his home port of Syros(Cyclades). He can pick you up in Lavrion(near the Athens airport) or you can meet him in the Cyclades. Archipel Club- Archipel Club offers a 53 foot catamaran for one week charters between Paros and Santorini. This is more of a sport catamaran for the more adventurous, it's not a luxury yacht. Caraya- Caraya is a skipper/owner yacht operated by Stefan out of Napflion. DRYachtingDRYachting owned by Antonis, operates a number of custom yachts specially outfitted for handicapped sailing. They also have extra ceiling height for the tall and he allows dogs on board. Antonis operates out of Athens. Dream/Gemini- Dream and Gemini are 62 foot yachts that have permanent skippers on board. They operate out of Athens. 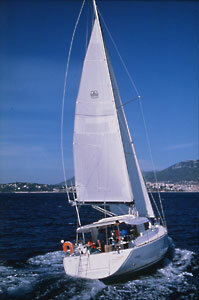 Kavas- Kavas offers bareboat/Skippered yachts, flotillas and cabin charters on 35-55 foot yachts. They have bases in Athens, Lefkas(Ionian), Kos(Dodecanese) and Skiathos(Sporades). Poseidon- Poseidon offers a cabin charter on a 55 foot yacht )which starts in Athens and explores the Cyclades for 7, 10 or 14 days) as well as bareboat charters and flotillas in Croatia and Turkey. They have Turkish Gullet cruises, a student party cruise, Archaeological Cruise and a Student Party Cruise. Seascape- Seascape offers cabin charters on 45-55 foot yachts that explore the eastern Greek islands(Dodecanese) and the Turkey coast. They also offer Skippered yachts with their famous "don't lift a finger" all inclusive charter. Samosail- Samosail offers Cabin Charters and bareboats on the island of Samos. Stressbuster- Stessbuster is owned by Lynda and Kosta. She is a 70 foot skipper/owner yacht available for charter out of Athens. Viking Star- Viking Star offers a series of cabin cruises on yachts holding 50 passengers and specializes in exploring the Cyclades Islands. Zeus- Zeus offers cabin charters on large 80-100+ foot yachts that hold up to 50 passengers. These are all inclusive charters that offer a way to see a lot of Greece in a short time. They offer charters in the Cyclades, Dodecanese, Ionian and some charters that explore two regions. At least one of their charters will originate in Athens.